Hello guys, I hope this blog post meets you well. 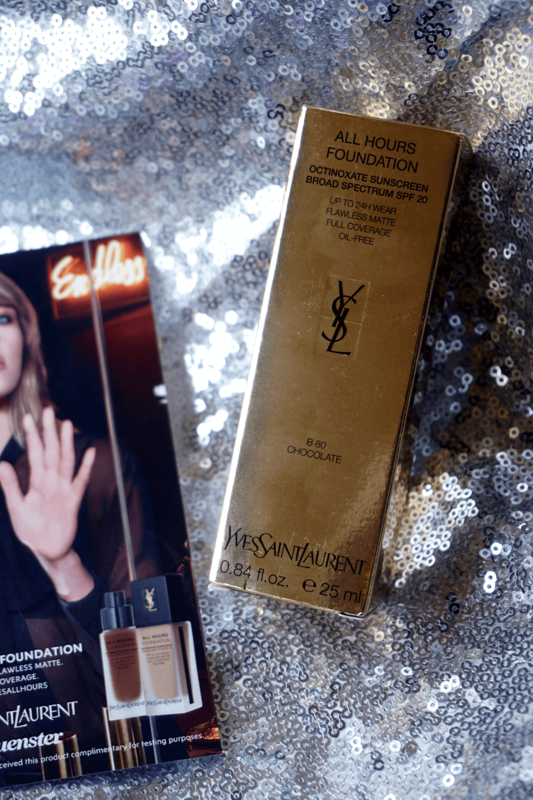 I received the new YSL All Hours foundation in shade B90 from Influenster for testing purposes. If you are not yet a member of Influenster take a quick break from reading this post and sign up for an account. You don’t need to be a blogger or vlogger to sign up for an account. However, you will need to have an account on one of the popular social media platforms like Instagram, Facebook, and Twitter. Influenster registration awaits you here don’t sleep on the opportunity to receive absolutely free full-size products. If you are already signed up what do you think about Influenster so far? I am a newbie but so far so good, however, I realized that being active helps you get free voxboxes. I got nothing when I wasn’t active LOL. So the fact that you have to be active to increase your chances of receiving products I might have to reconsider my “absolutely free full-size products” statement LOL, because it does take time to be active and time is money. Anyway, this is my second voxbox from Influenster. The first voxbox I received was for the L’Oreal Paris Revitalift Triple Power Deep-Activating Moisturizer Cream campaign which by the way I should probably review on here. 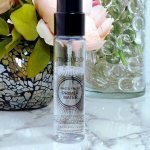 Overall, I am a little late to the Influenster party! I was sleeping on me but better late than never LOL. So now you have taken care of business let us continue. 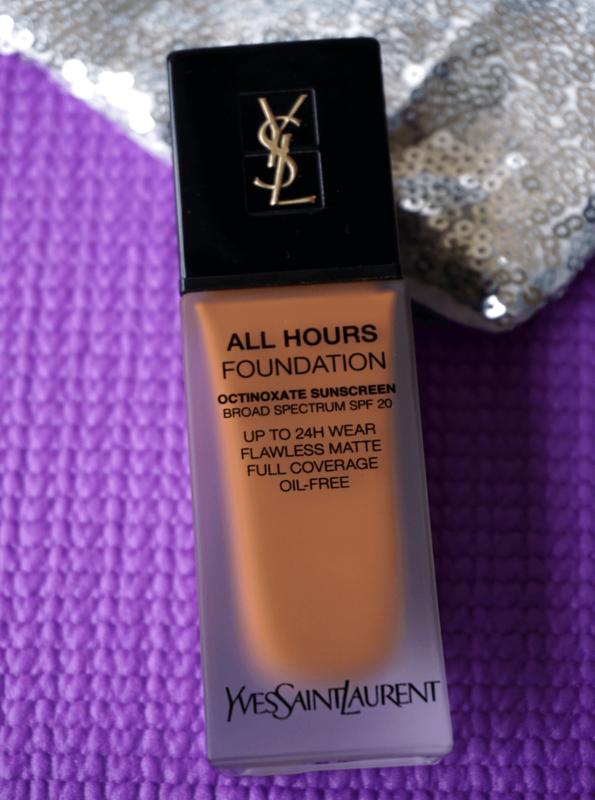 Firstly, this YSL All Hours foundation is pricey! It retails at $58.00 dollars plus tax depending on where you’re buying it from. If you purchase it from an online store that doesn’t collect tax in your state you will likely not pay tax on the purchase. I bought the shade B80 on Sephora online and there was a tax of $4.79, so definitely do your research to save money if you buy this foundation. I only purchased it from Sephora because I wanted the three samples. Additionally, I used ebates so I was able to get cash back on my purchase. My cashback from online purchases is growing because of ebates. I could have also selected Mypoints to get points I could later redeem for gift cards but I used ebates instead. I wish both Mypoints and ebates could be used together but Sephora doesn’t allow it, so you have to pick sadly. If you shop online often and you don’t have ebates and Mypoints extension on your browser tab you are missing out on cash back opportunities. I have used ebates for a while I just started using Mypoints, but better late than never. Sign up to start saving on your online purchases. Now you probably wondering if you got it for free why did you purchase it. Well simply put it I messed up! My first task was to select the most reasonable shade and I failed miserably. 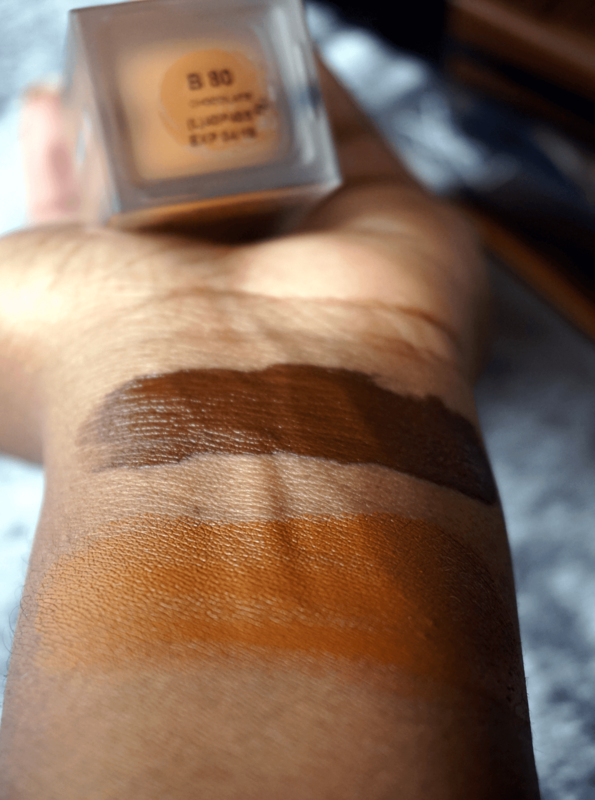 When buying foundations online and the shades for people of color are limited I have always opted for the color before the last shade and this has always worked in the past. I did that for Re(marc)able Full Cover Foundation Concentrate by Marc Jacobs which is remarkable by the way and the Chanel Perfection Lumiere Long Wear Flawless Fluid Makeup which they discontinue (sad face) but for this one, I didn’t follow my rule. Anyway, I used B90 to contour and I liked how it looks so I decided to buy the B80. This was a mistake you will see why in a bit. Now in my defense, there are only three shades for deeper skin tones and the B90 shade looked like it would be a good match for me. Additionally, the shade was described as a deep golden undertone so I was like great. If it’s golden then it’s probably a deep chocolate color with a medium yellow undertone. Oh, boy was I wrong! 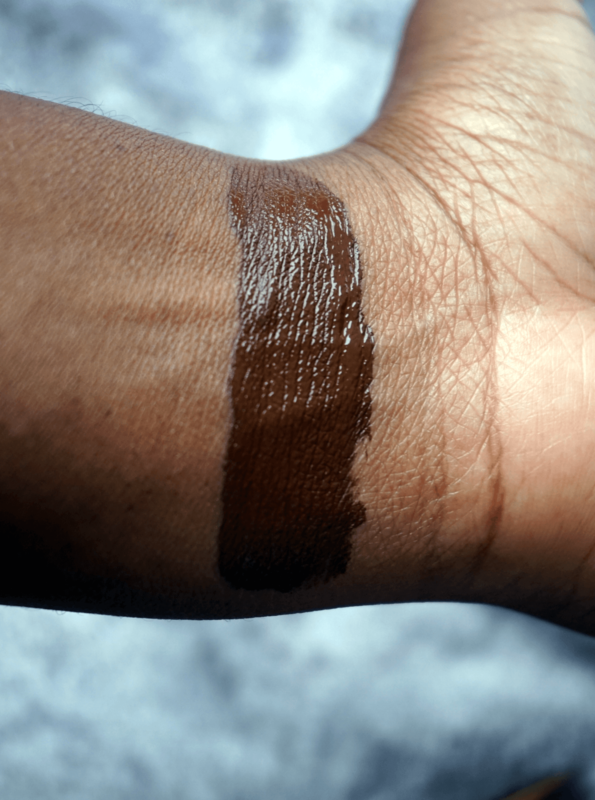 This shade is nothing golden ya’ll I was out here with the Michael Jordan crying face when I swatched the foundation. Companies that manufacture limited dark skin foundation shades are missing out on the cash stream from this group. They have many excuses why they don’t produce a better color range of deeper foundation shades for people of color. The most popular excuses are: (1) It is hard to produce deep shades. (2) This market segment doesn’t purchase foundations at this price range. To the first excuse, I say try harder, because it really sends out the wrong message when a new product is released and there are only three shades for people of color. It sends the message that ya’ll don’t want us wearing ya’ll foundations. To the second excuse, I say we can’t buy what that’s not available. 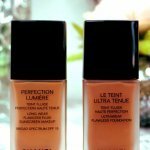 I have seen huge improvements in the color range of most drugstore foundations and beauty supply store foundations than I’ve seen in high-end makeup products. It a little weird though, because drugstore foundations and beauty supply foundations are priced lower than high-end foundations but yet still they have the funds to research and improve their color range. Now don’t tell me since the foundations are cheaper they sell more, hence they have more money for research – I call BS. However, I am open-minded and hopeful that these companies will adjust their policies to include a wider color range for people of color. If you are planning on purchasing this foundation I highly recommend getting color matched at the store and getting a sample. 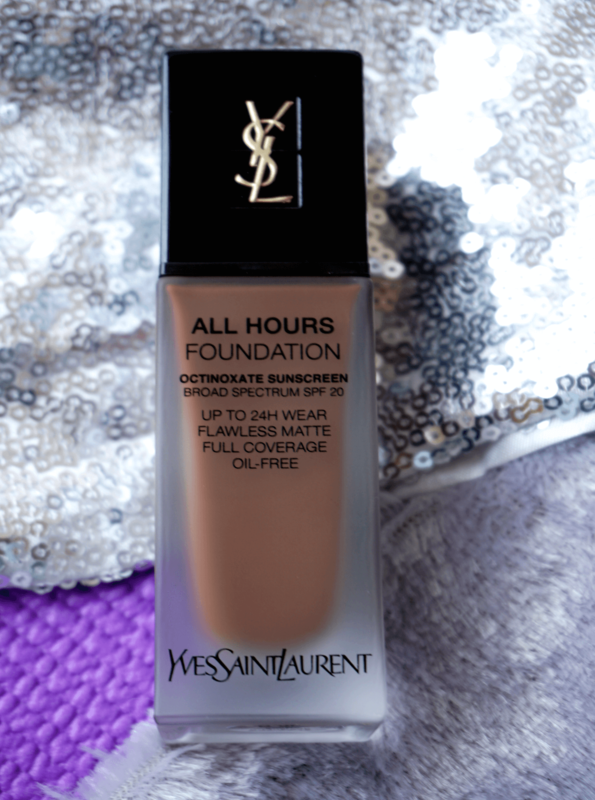 If you’re in the UK you can order your free YSL All Hours Foundation sample here until supplies last. This shade is at least 3 shades darker than my skin tone and that made it a great contour shade, so I’m currently using it as a contour. Now would I have ever purchased this shade just for contouring or even mixing it with another color to find my shade? Uh no! That’s above my contouring budget. My contouring products are very affordable because I don’t think higher-end contouring products are worthy of a splurge. I might change my mind in the future, however, for now, I am fine with under 10 dollars contouring makeup products. This shade is almost my perfect shade but sadly it oxidizes a shade darker. I usually buy my foundations a shade lighter to counter the effect of foundation oxidation. This technic works most of the time. Sometimes it fails miserably because the foundation doesn’t oxidize and the foundation shade is not deep enough to wear on its own. Now foundations that don’t oxidize are great and rare especially for people with extremely oily skin. I fall into the extreme category so the majority of my foundations start to oxidize a couple of minutes after they have been applied – tough luck but it is what it is. These claims though. LOL! I am going to be direct and say some of these claims are a marketing lies – they will say anything nowadays for sales. Yes! Straight up lies. It is transfer-proof before you oils start to penetrate through the foundation. When your oils start penetrating through your makeup it will start breaking up and the foundation will start to transfer. You need an oil base makeup remover to get this off your face properly so that oil-free claim I am not sure about that. Maybe they should have said it contains less oil. LOL! But you know that would not be good for sales. Well, I didn’t get a break out from wearing the YSL All Hours foundation so it just might be non-pore clogging so they probably can claim that. I own Re(marc)able Full Cover Foundation Concentrate by Marc Jacobs which I highly recommend if full coverage is your thing and you can find your shade so I can tell y’all this claim is straight up nonsense. This foundation is not full coverage. This provides a medium coverage with the potential to become full coverage if you add extra layers or use a concealer during the application process. They need to find out what Marc Jacobs did to achieve their full coverage foundation because this ain’t it. Now for the first two to three hours it stayed put and it did look like and feel like I just applied it. They get points from me for this. Touch-ups were required for me so I don’t know about this claim. I didn’t keep it on for 24 hours so I can’t judge. It gives the skin a nice glow after application but saying it blurs and erase imperfections and pores is definitely reaching. It smells nice. Now if you don’t like scented foundations this might be a con for you but I didn’t mind the smell. It is really light on the skin. You will fall asleep with this foundation if you’re not careful. If you own Estée Lauder Double Wear Stay-in-Place Makeup and you don’t like how heavy, it feels this might be a foundation you want to try if you don’t mind the cons below but get a sample. Too expensive given its performance – there’s better out there. Also too expensive for the amount of product you’re getting. I think they tried to copy what Marc Jacobs did with their Re(marc)able Full Cover Foundation Concentrate. This Marc Jacobs foundation has 0.75 oz and costs $55 dollars, so it seems like the YSL team decided to offer a “full coverage foundation” at $58 dollars for 0.84 oz to compete with the full coverage foundation by Marc Jacobs. But the thing is the Marc Jacobs foundation is actually full coverage while YSL All Hours Foundation is not. Not full coverage. You need at least two coats on each side of your face to achieve full coverage look if you usually use a beauty sponge. If you’re oily it’s going to start transferring after a few hours so touch-ups are required. Does not blur or minimize pores you will have to depend on your skin care or primer for that. There’s a bit of flashback so this is not ideal for flash photography. So for important events where you know, you will be taking photos this might not be a great choice. This is not an oil-free foundation. It oxidizes a shade darker. Doesn’t control oil for more than two hours. The YSL All Day Foundation shade range is awful. Provided the best full coverage on half my face with one pump. However, the final look is not airbrush. I needed two pumps to over half of my face but the final look was airbrush and it looked great. I used a flat top to apply this foundation and application was good. The coverage was better than the coverage I had with the beauty blender and I used less product. The Clarisonic sonic foundation brush head applies this foundation beautifully, so double thumbs up to Clarisonic for creating this spinning foundation brush and I used less product. So if you want to save product apply this YSL All Hours foundation using your fingers and use a beauty sponge slightly to complete the application. However, if you can avoid using a beauty sponge do so because soaks up way too much product and this foundation is too expensive for that. If you own a Clarisonic foundation brush you will be happy because it applies this foundation beautifully, but if you don’t own one a flat top brush will also get the job done. I’ve learned to only use two pumps to cover my face to avoid a “caked-up” look. I used it with and without a primer. I got the best results when I used it without a primer. The foundation stays put when other products like concealer, blush, and highlight are layered on top of it. YSL All Hours Foundation Worth it? Overall, it is a decent foundation but for my needs, I have tried better within and below that price range. There are some pros but they need to go back to the drawing board to improve this formula and the shade range. 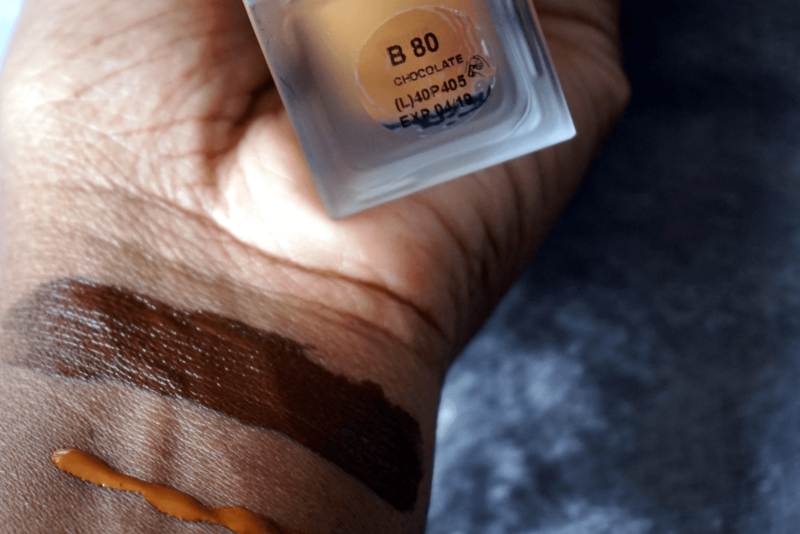 I will use shade B90 to contour because I think it’s a great contour shade for my skin tone. However, I will return the B80 to Sephora and get the Chanel Le Teint Ultra Tenue Ultrawear Flawless Foundation Ultrawear Foundation Fluid from Macy’s or the Chanel website. 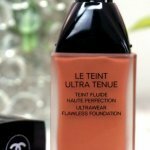 Unfortunately, they discontinued Chanel Perfection Lumiere Long Wear Flawless Fluid Makeup so I hope the Chanel Le Teint Ultra Tenue Ultrawear Flawless Foundation Ultrawear Foundation Fluid is just as good or better. 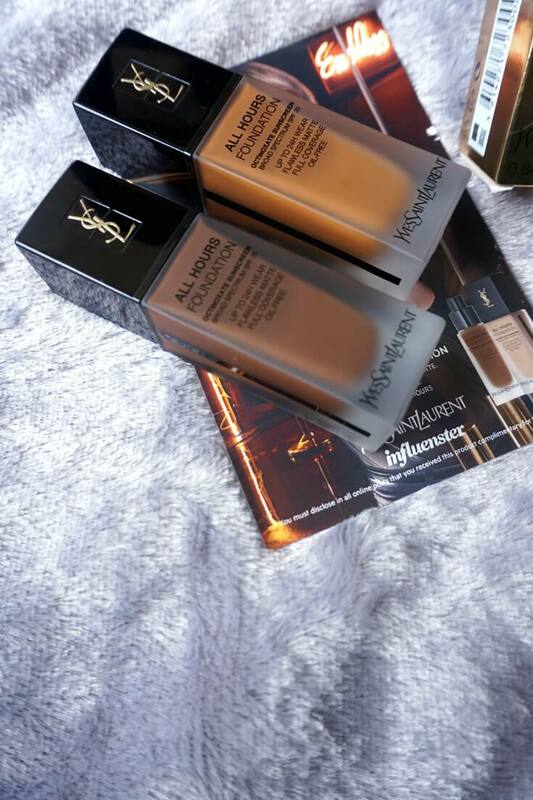 So here you have it guys, I think the YSL All Hours foundation is just a decent foundation nothing spectacular, but the hype is real so get a sample to be on the safe side. For the deeper tone queens out there, chances are you will not find your foundation shade but no big deal really there are other companies that do cater to deeper skin tones so check them out, until next time stay chicly, poised and driven! If you sample this foundation let me know how it works out. Aww, stinks that it was just mediocre. You would expect the bomb dot com from YSL. 🙁 Looks like it’s not a great choice for oily skin. I thought it would be but not for me. Everything is not for everybody. I will be sticking to what works. ?